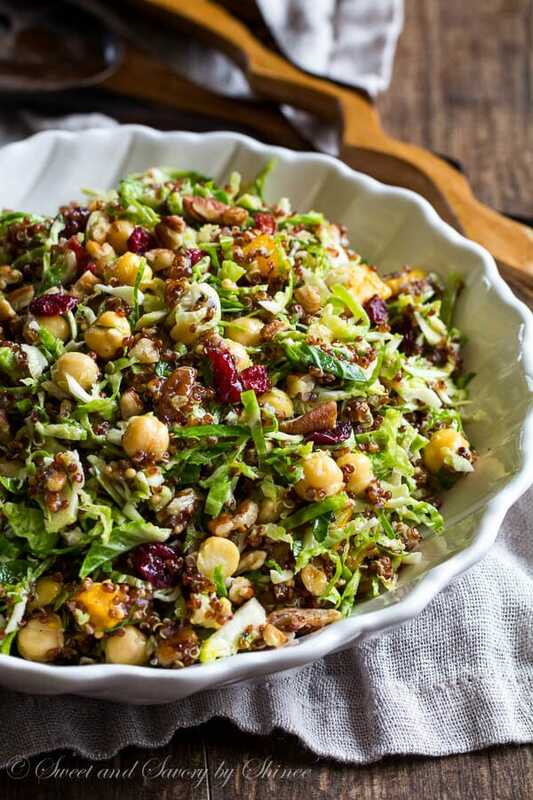 Lots of texture and lots of flavor in this festive quinoa brussels sprouts salad. Who said salad can’t be the center of attention at Thanksgiving dinner? Look, we had quite an amazing crop of sweet corns, potatoes, pumpkins and squashes this year. We’re also raising handful of turkeys at the ranch!!! (See it for yourself. I shared it right here, scroll to the bottom.) Isn’t that crazy and exciting? I’m so proud of my husband though, it’s all his doing! So here’s what’s on our Thanksgiving menu. I’m making this make-ahead mashed potatoes, creamed corn, and I’ll ask my MIL to make her sweet potato casserole, but with squashes. For dessert, our favorite pumpkin mousse pie and this pecan pie from Simply Recipes. And Garrat will be in charge of the turkey, as always. My gosh, this planning makes me salivate. I can’t wait for Thanksgiving dinner. It’s going to be so fun!! And delicious! Oh and the greens. Let’s not forget to serve some greens! 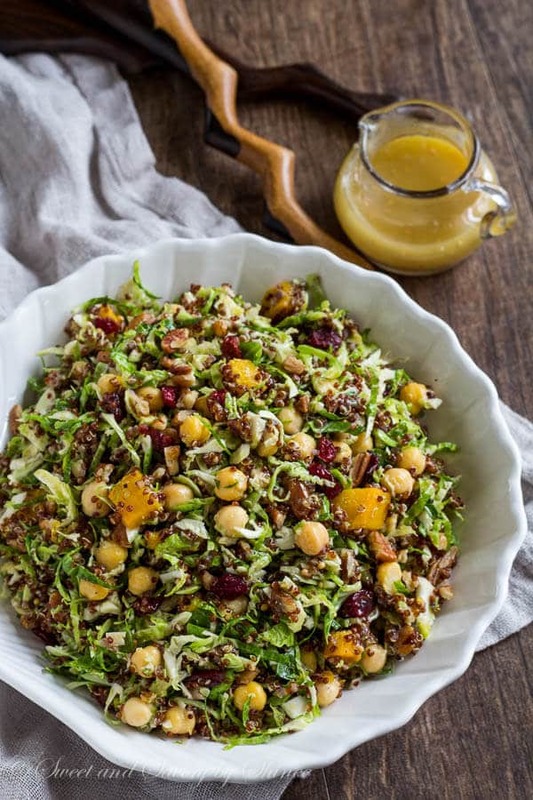 This warm quinoa brussels sprouts salad is also on the menu. It’ll be the only thing that isn’t home-grown. But hey, it has squash in it! That counts, right? ? There’s so much good things are going into this salad. Let’s start with squash. Roasted squash might be one of my favorite things in the fall. It adds nice warm, sweet and soft element to the salad. You’re welcome to use any kind of winter squash: acorn, or delicata, or butternut squash (my favorite). And no need to go crazy with seasoning here. Olive oil, salt and pepper will do perfect. Red quinoa adds not only awesome texture and nutrition, but also beautiful festive color! Of course, you can use yellow quinoa, but red ones are so much prettier!! (?? says the girl obsessed with everything red! ?) Don’t forget to rinse the quinoa well before cooking, or you might end up with sandy quinoa. Maybe it’s the brand I buy, but I always have to wash mine really well, so I thought I’d remind you too. Again, no need to season it, other than with some salt. Ok, onto the star of the show: brussels sprouts. The key is super thinly sliced brussels sprouts! Here’s what I do: wash them thoroughly (not my favorite part), cut them in half, and then cut out the tough core, as pictures below. Then slice them as thin as you can. I say, the thinner, the better. You don’t wanna sit there and chew the salad for 10 minutes, do you? 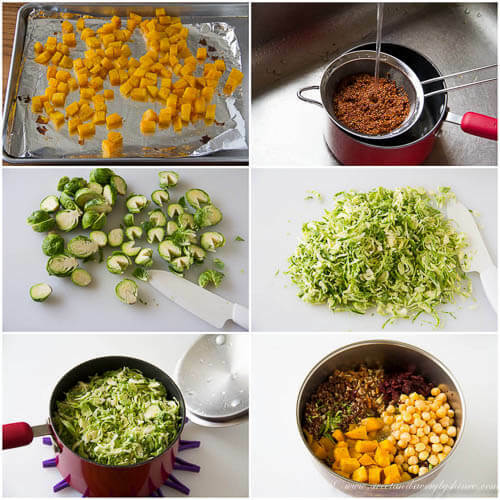 Once the quinoa is cooked, add shaved brussels sprouts, cover and let it sit for 10-15 minutes to soften. Now, add-ons: chick peas for texture, walnuts for crunch, dried cranberries for sweetness. And all these are tossed with my homemade honey dijon dressing!! Perfection! ?? Make-ahead tip: Since there isn’t any leafy greens, you can prepare everything in advance. I’d mix everything, except for walnuts and dressing, and refrigerate it. And right before serving, warm the salad up a bit and toss with nuts and dressing. Hope this recipe inspired you to make a killer salad for your Thanksgiving. ? Line a baking sheet with a foil and toss the squash cubes with olive oil, salt and pepper. Roast for 30-40 minutes, or until tender. Place the quinoa in a small saucepan and rinse a few times. Add 1cup water, ¼ teaspoon of salt. Bring it to a boil over medium high heat. Reduce heat to medium low and simmer for about 15 minutes, or until the water is absorbed and quinoa is tender. Wash the Brussels sprouts thoroughly. Cut them in half, and then cut out the tough core, as pictures below. Then slice them as thin as you can. 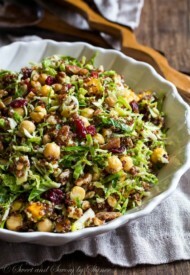 In a large bowl, combine shaved brussels sprouts, squash, quinoa, chick peas, walnuts and cranberries. Toss with honey Dijon dressing and serve warm. Make-ahead tip: Mix everything, except for walnuts and dressing, and refrigerate it. 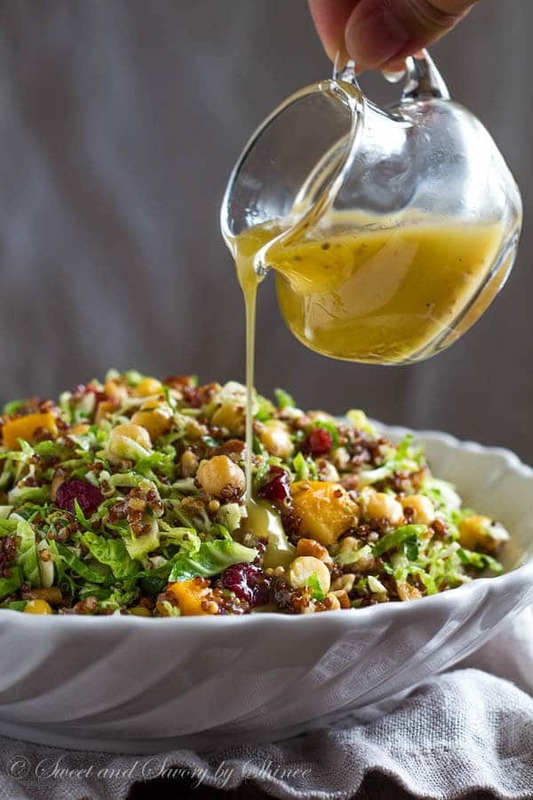 Right before serving, warm the salad up a bit and toss with nuts and dressing.